DESCRIPTION This renovated bungalow in the sought after Community of Huntington Hills rest on a quiet street ACROSS FROM A PARK & features 2252sqft of finished living space w/4 beds & 2.5 baths. The light, bright & airy main floor features an open kitchen & living area w/meticulous upgrades, neutral colours, high ceilings, potlights, hardwood, two midcentury wood fireplaces, large windows, beautiful french doors & views of the private large backyard w/mature trees. The new kitchen has stunning granite, stainless steel appliances, a gorgeous backsplash & opens up to the proper dining room. The main floor also features a master bedroom w/an ensuite, as well as 2 large bedrooms & an additional full bath. The large basement gives you all the extra room you need with two bedrooms, rec room & family room. The sizeable backyard & front yard offers function and privacy- large mature trees & a huge deck. This home has easy access to all kinds of parks (Nose Hill) all amenities, restaurants & schools! Book your showing today! Home for sale at 7732 Hunterquay RD Nw Calgary, Alberts T2K 4T8. 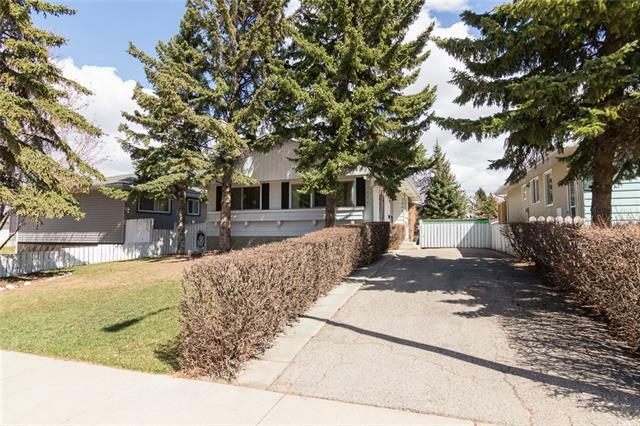 Description: The home at 7732 Hunterquay RD Nw Calgary, Alberta T2K 4T8 with the MLS® Number C4238726 is currently listed at $449,800.